Many gather at the Itsukushima Torii Gate while the tide rest at the base of the gate. Photograph by Timothy Dixon. This past October, I joined HBA’s Japanese language class as they traveled across the Pacific to experience the culture of the Japanese people. Even though I had traveled to Japan before with my family, this trip felt special as I had never traveled internationally with my friends. 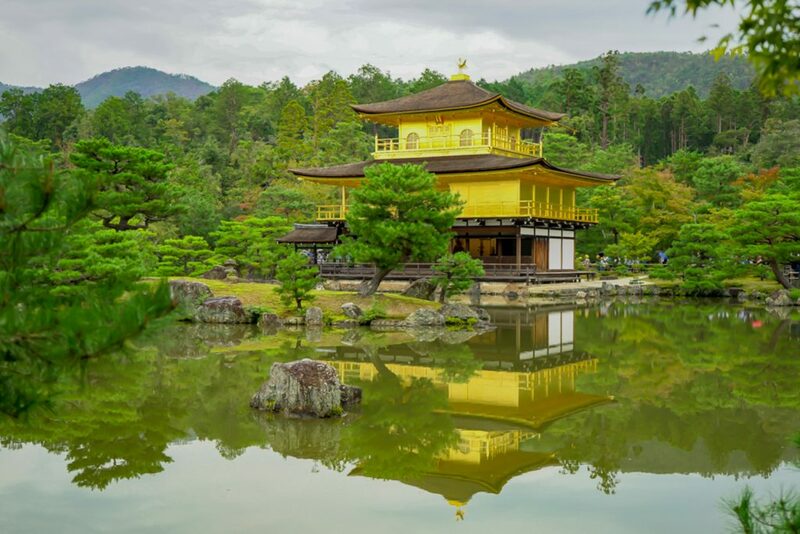 The Golden Pavilion (Kinkakuji) sits elegantly across a lake of water. Photograph by Timothy Dixon. The Kinkakuji is a Zen Buddhist temple located in the old capital of Japan, Kyoto. Shogun Ashikaga Yoshimitsu built the pavilion for his retirement and it was converted into a Zen Temple after his death. The day was overcast when we visited, but when we walked along the lake across from the temple, the sky had cleared up. There before me sat the elegant golden temple reflected on a serene lake. A piece of mochi made traditionally in Kyoto. To its side a chawan that holds the matcha tea. Photograph by Timothy Dixon. Tea has been a regular part of Japanese culture and life for thousands of years. 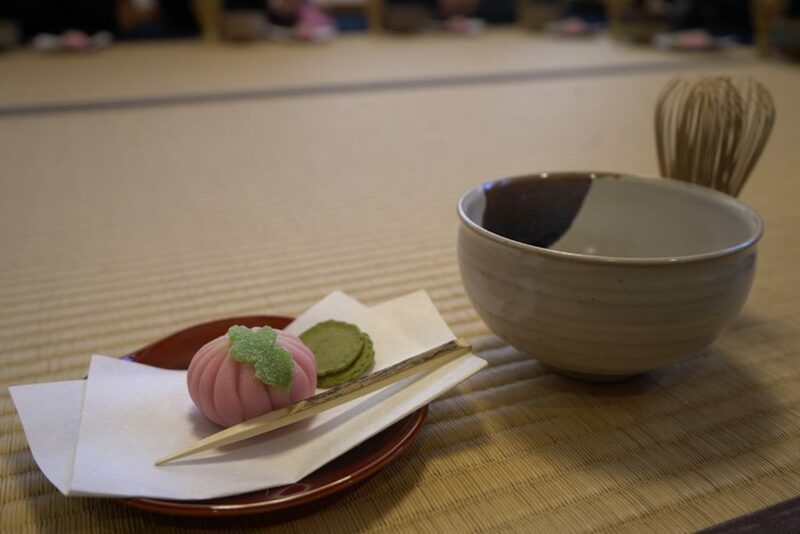 The Japanese tea ceremony embodies harmony, respect, purity, and tranquillity. During our visit to Doshisha Kori High School, our hosts led us through a traditional tea ceremony. This was a special moment for many of us on the trip as we had never experienced something like that before. 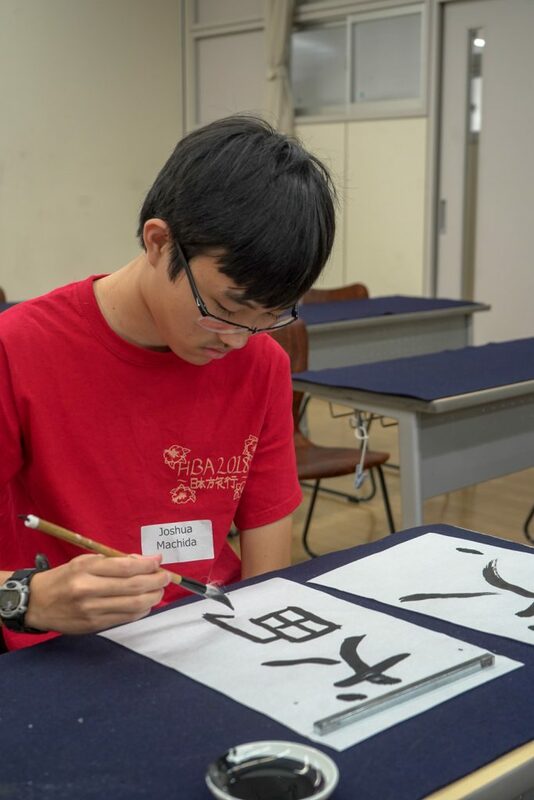 Junior Joshua Machida writes “dog house” in Japanese. Photograph by Timothy Dixon. 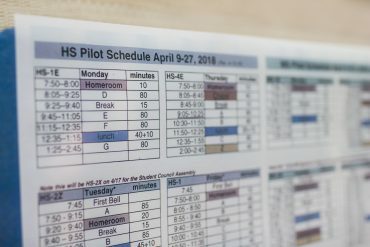 Part of our cultural experience at Doshisha Kori High School included shodo or Japanese calligraphy. We sat down in a classroom to learn how to write short phrases and symbols in kanji (Japanese characters) from Doshisha Kori teachers. 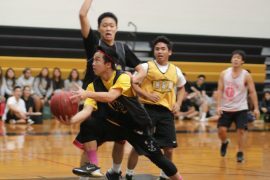 Junior Lance Tasaka holds up three pieces of mochi that he made. Photograph by Jarin Ashimine. To truly learn about another culture, one should engage in traditions or activities that are part of their everyday life. Mochi-making is one of them. On our first full day in Japan, we went to a quaint mochi-making place in Kyoto called Kanshundo Higashi-ten. 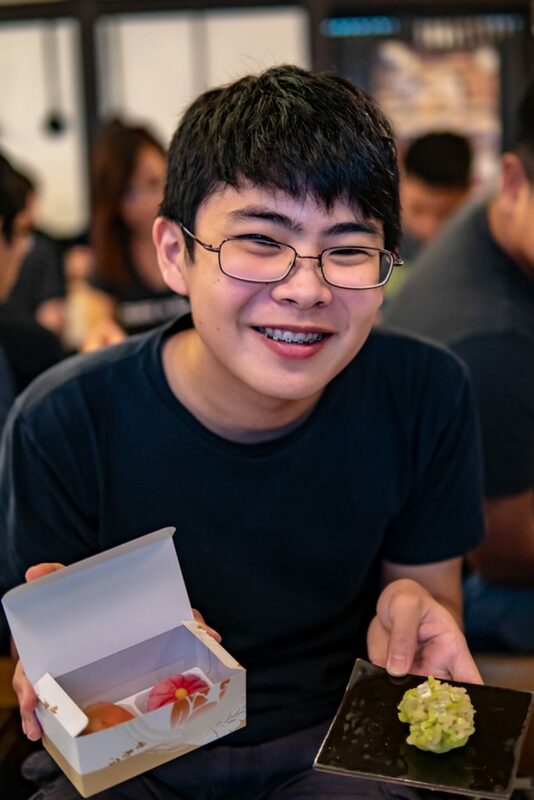 The sweet aroma of azuki bean (red bean) filled the air as we entered, and an instructor began to demonstrate the making of the delicate dessert. Many of us struggled to form perfectly-shaped mochi, but all of us enjoyed eating our creations at the end. Visitors gather at the Itsukushima Torii Gate when the tide is low. Photograph by Timothy Dixon. 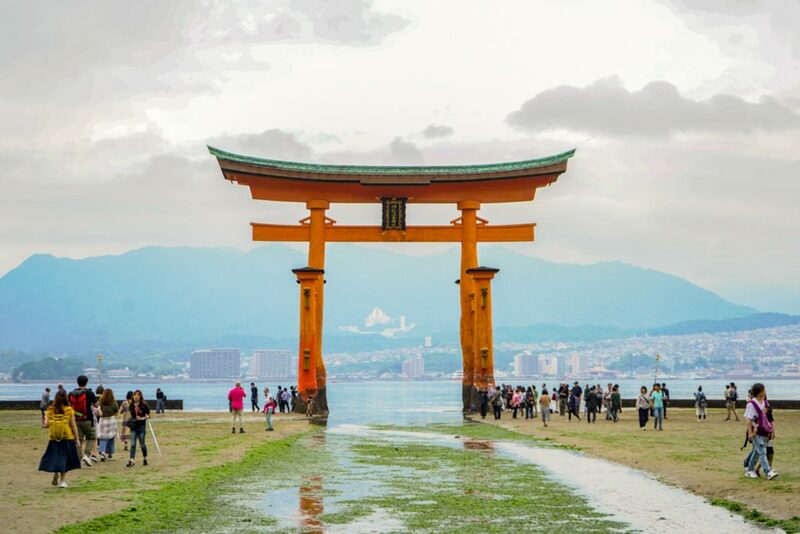 The renowned Itsukushima Torii Gate is the first thing people see as they arrive at Miyajima Island. The gate is part of the Itsukushima Shrine that also sits at the edge of the sea, both appearing to float when the tide is high. On my previous trips to Miyajima, I was never able to see the gate up close as the tides were high. Luckily for me this time, the conditions were perfect; I was able to stand on a little rock path directly in line with Torii Gate and snap this shot. Junior Jessica Miyasato hangs a string of one thousand cranes, made by HBA’s Japanese class, inside the Children’s Peace Monument. Photograph by Timothy Dixon. 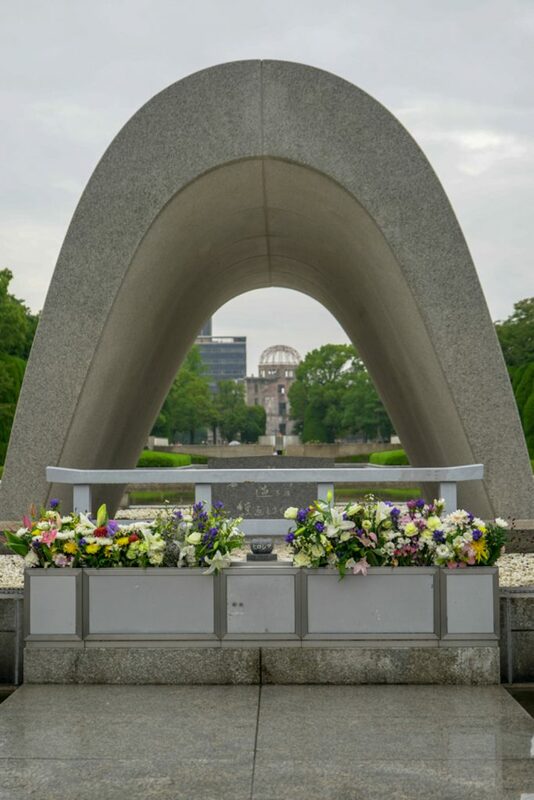 Located in the Hiroshima Peace Memorial Park, the Children’s Peace Monument was built in memory of Sadako Sasaki, who was two years old when the atomic bomb fell on Hiroshima. While she survived the immediate impact of the bomb, radiation caught up with her and she eventually died from leukemia. 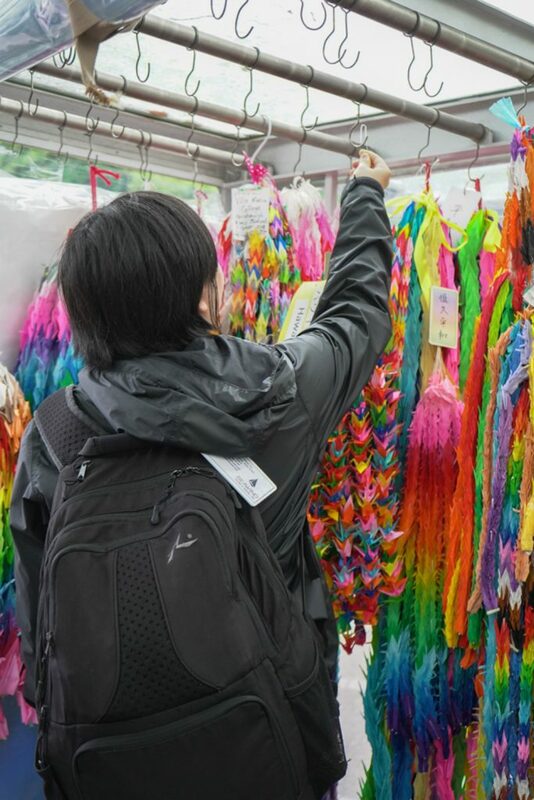 HBA students folded 1,000 cranes to bring to the monoment, as a symbol of peace and to pay respect to the children lost to the A-bomb. I was struck by the juxtaposition of the colorful and uplifting strings of cranes and the tragedy behind the memorial. The Genbaku (“A-Bomb”) Dome, eternal peace flame, and Cenotaph united into one view. Photograph by Timothy Dixon. These three monuments in the park tell of both the horrors of atomic warfare and the world’s hope for peace. In the background is the Genbaku Dome, a UNESCO Heritage site, which serves as the Hiroshima Peace Memorial. The dome was the only building left standing after the A-bomb was dropped. In the foreground is a cenotaph, which is a monument etched with the names for all the victims of the bomb. In between the dome and the cenotaph is the Peace Flame (which has been burning since August 1, 1946) in the hope of a world without nuclear weapons. It’s hard not to be remorseful knowing that we come from the country that caused all this death and destruction. I was reminded that we should never let this happen again. 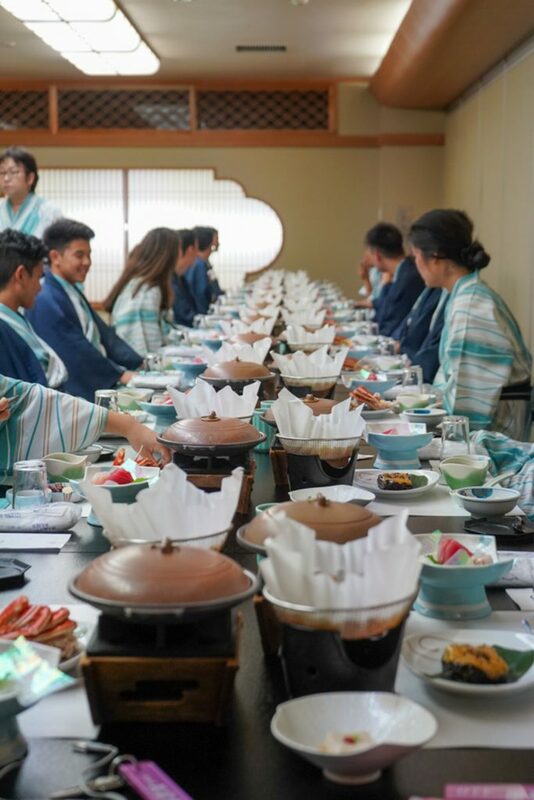 Dressed in yukatas, HBA students enjoy a traditional Japanese ryokan meal for dinner. Photograph by Timothy Dixon. After a long day of traveling on bullet trains and buses, we arrived at Hotel Mifujien, a Japanese ryokan (a traditional inn). The evening featured a kaiseki dinner where everyone wore a yukata (a casual kimono). 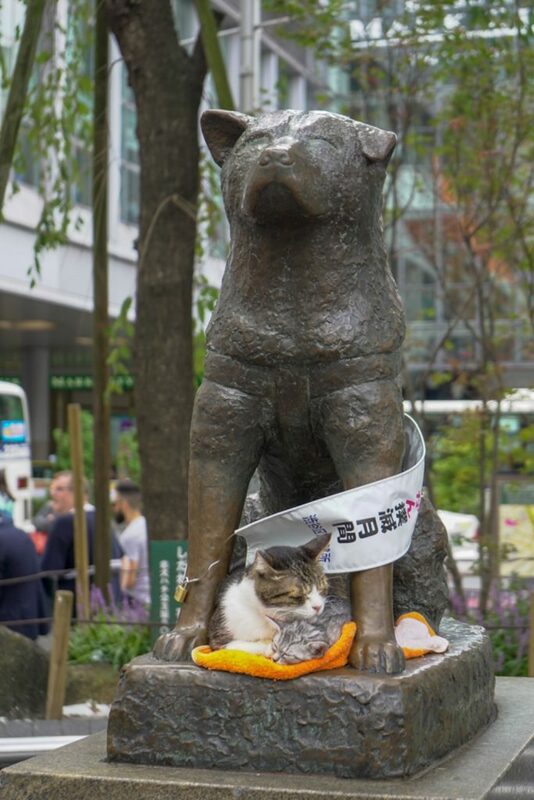 Two cats rest under the Hachikō statue at Shibuya Train station. Photograph by Timothy Dixon. Hachikō was a dog that became a national hero in Japan. The dog became famous after he showed up every day to wait for his master at the Shibuya train station even after his master’s death. On our free day in Japan, we commuted to the Shibuya train station and got to see the Hachikō statue. It was a wild experience as we also visited the Shibuya crossing, the world’s busiest intersection. It was hard to get a shot of the statue without tourists in the way, but in the end my patience paid off. 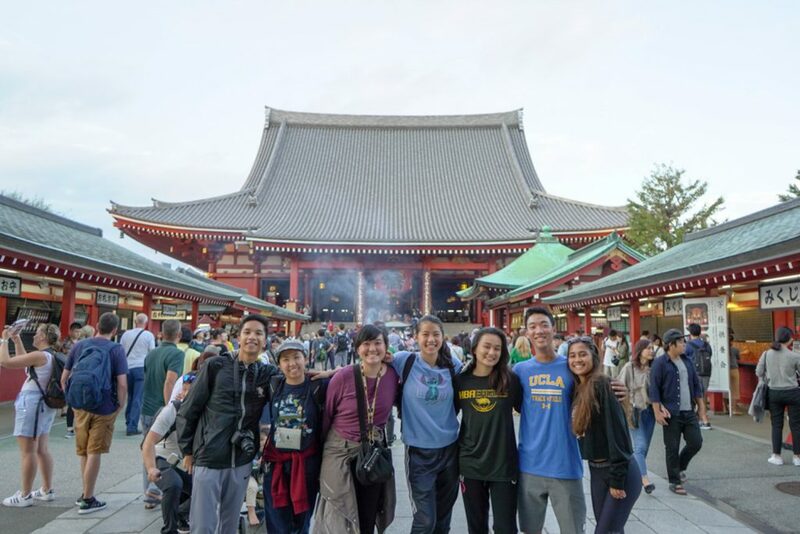 (Left to right) Seniors Niko Lopez, Caily Okazaki, Jayni Ishikawa, Mikayla Chun, Nicole Arakaki, Kasen Wong, and Justice Stone stand before the Sensoji Buddhist temple, the oldest temple in Tokyo. Photograph by Timothy Dixon. Sensoji Temple, or Asakusa Kannon Temple is the oldest Buddhist Temple in Tokyo. It was our the last stop in Japan, and I found it to be one of the most memorable places we visited. The temple gave off a surreal feeling that made me want to come back, especially with the friends that were on this journey with me.